There, the echoes of Hispanic Catholicism permeate even the most resolutely Protestant, as well as non-Christian, neighborhoods. As part of their historical education, California school-children of all faiths are taken to visit the mission churches founded by Franciscan brothers, and learn local geography as a kind of litany of saints’ names. As a child, I was profoundly affected by both the visual and the spiritual texture of the mission churches I had visited. The side walls, the massive ceiling beams, and especially the reredos behind the altars, were filled with painted and carved patterns; the statues and sacred images were clothed in lace and filigree. Although now I think also of the problematic nature of conquest and colonization, my earliest memories of these places are of the aura of prayer that infuses them. Years later, in Israel, I visited mosques whose walls were covered with ornate calligraphies and decorative motifs. There, I experienced the same sense of peace, mystery, and the presence of God. Likewise, in the gothic cathedrals of Europe, and in the illuminated books created in medieval monasteries, the same love of ornament spoke to me of the extravagance of creation. The rich mosaics, paintings, jewels, and precious metals that adorn many places of worship are intended to make those who enter feel as though they were already in heaven, if only for a brief moment. In my own work, I am attempting to evoke this sense of eternity, of the divine presence, that I find in these traditional artforms, as well as in the gleam of flickering candles, or in a night sky filled with stars. 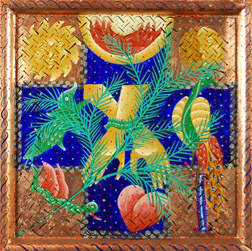 As an analogue to my belief that every time and place participates in God’s self-revelation, I combine elements from the icon tradition of the Eastern branches of Christianity; the elaborate knot work found in Celtic artifacts; the space-filling patterns of Islamic tiles; folk motifs from Latin America, Africa, and Asia; and contemporary notions about art. The resulting paintings are intended as an offering into the life of the Body of Christ, my own prayers made visible as an invitation to others.